Sadly summer is coming to an end but that means, decorating season is approaching. I love fall colors, thanksgiving themes and warm tones in my home. I also have a 70’s couch that is up for a much needed revival. I found these earth fall tones in my scraps bin. Don’t you love when you find inventive and creative uses for your scraps? I do! This pattern fits a standard size 12″ square decorative pillow. The pinwheel measures about 14″ diameter. 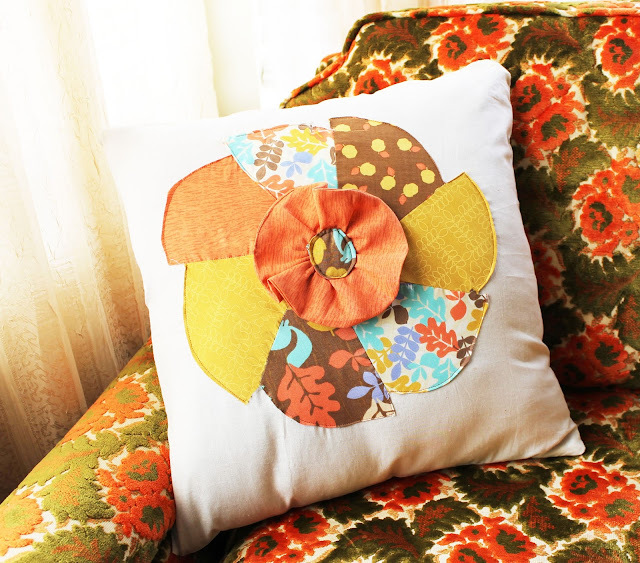 You can scale the pattern for a smaller or larger pinwheel design. You can also apply this pattern to quilts since this pinwheel size will fit perfectly on a fat quarter. I hope you like it and please post pictures if you use the free pattern. Download the free pattern HERE. The pattern already has 5/8″ seam allowance. Cut out your pinwheel pieces and lay them shorter side to longer side next to each other. The last piece will align differently than the rest. It will have its longer side close to the longer side of its neighbor piece. Sew the pieces together with right sides facing each other. You can do two a time and then sew your pairs together or just sew one after the next until you come to the last piece. The last piece will be sewn to two pieces. Iron down the 1/8-1/4″ on all the top arcs of the pinwheel pieces as well as the inner sides. Pin your pinwheel on the center of one of your 18″ square. Sew the pinwheel on the square by top stitching over your ironed seams. Take your two pieces from your large circle and sew right sides together. Leave a 3″ opening. Turn it inside out and top stitch your opening. Cut a small hole in the middle of the circle you just made. Lengthen you stitch length to the longest on your machine and sew around the hole about 1/2″ from the center. Pull the threads to gather the center. Sew the gathered circle in the center of your pinwheel. Do the same thing with the small circle except don’t cut a hole or gather the center. Sew in the middle of the larger circle on the pinwheel you sewed earlier. To sew the zipper: sew together your square that has the pinwheel on it to the other square, right sides together on the top using a 1″ seam allowance using a long stitch length. Open up the seam by ironing and place your zipper face down. Sew on both sides of the zipper using the zipper foot on your machine. When you are done sewing the zipper in the center of the seam, open up your seam. Open up your zipper and sew all the sides of your pillow. Turn it inside out through your zipper and you are done. Put in your pillow (12×12″) and zip it up.